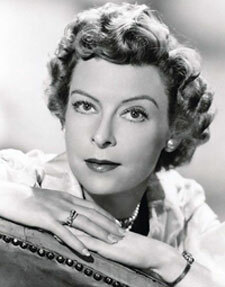 Ann died at 89 on September 19, 2000. 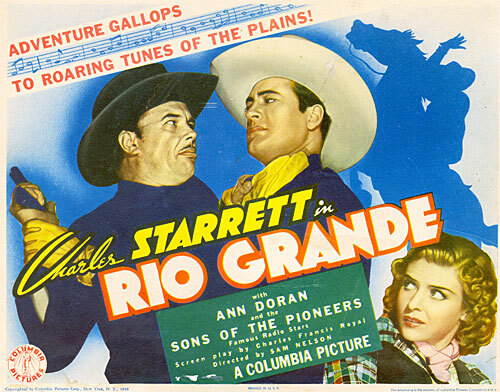 Movies: Rio Grande (‘38 Columbia)—Charles Starrett; Romance Of The Redwoods (‘39 Columbia)—Charles Bickford; Calamity Jane and Sam Bass (‘49 Universal Int’l. 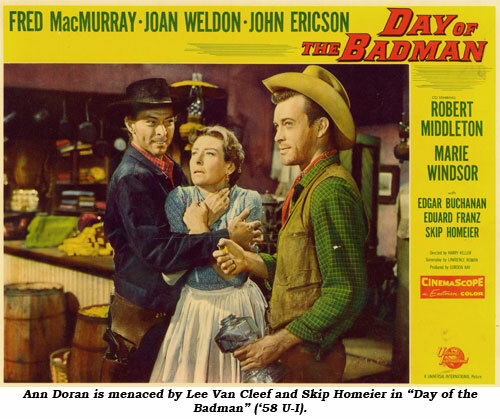 )—Howard Duff; Tomahawk (‘51 U-I)—Van Heflin; Rodeo (‘51 Monogram)—John Archer; Shootout At Medicine Bend (‘57 Warner Bros.)—Randolph Scott; Badlanders (‘58 MGM)—Alan Ladd; Day Of The Bad Man (‘58 U-I)—Fred MacMurray; Rawhide Trail (‘58 Allied Artists)—Rex Reason; Cast A Long Shadow (‘59 U-I)—Audie Murphy; Warlock (‘59 Fox)—Richard Widmark; There Was A Crooked Man (‘70 WB)—Kirk Douglas; Hired Hand (‘71 MGM)—Peter Fonda. TV Movies: Macahans (‘76)—James Arness; Peter Lundy And The Medicine Hat Stallion (‘77)—Leif Garrett. 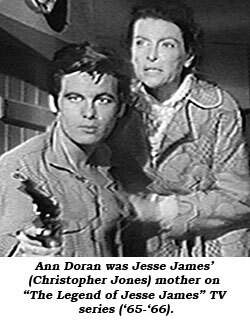 Serials: Spider’s Web (‘38 Columbia)—Warren Hull; Green Hornet (‘39 Universal)—Gordon Jones; Flying G-Men (‘39 Columbia)—Robert Paige. TV: Roy Rogers: Peril From The Past (‘52); Lone Ranger: Treason At Dry Creek (‘52); Lone Ranger: Hidden Fortune (‘53); Gene Autry: Johnny Jackaroo (‘54); Gene Autry: Carnival Comes West (‘54); My Friend Flicka: Old Danny (‘56); Gray Ghost: Charity (‘57); Broken Arrow: Legacy Of A Hero (‘57); Frontier Doctor: Drifting Sands (‘57); Sheriff Of Cochise: I Am An American (‘57); Sheriff Of Cochise: Sheriff Finds A Heart (‘57); State Trooper: Live Shell Game (‘57); U.S. Marshal: The Promise (‘58); Colt .45: Saga Of Sam Bass (‘59); Colt .45: Impasse (‘59); Texas John Slaughter: Showdown At Sandoval (‘59); Wagon Train: Ricky and Laura Bell Story (‘60); Rawhide: Incident Of The Challenge (‘60); Virginian: Run Away Home (‘63); Virginian: Fortunes Of J. Jimerson Jones (‘64); Virginian: Portrait Of A Widow (‘64); Virginian: Lady From Wichita (‘67); Legend Of Jesse James: series regular (‘65-‘66); Bonanza: Ballad Of The Ponderosa (‘66); Bonanza: Real People Of Muddy Creek (‘68); Guns Of Will Sonnett: And He Shall Lead The Children (‘68); Alias Smith And Jones: Witness To A Lynching (‘72); Father Murphy: The Horse (‘82).